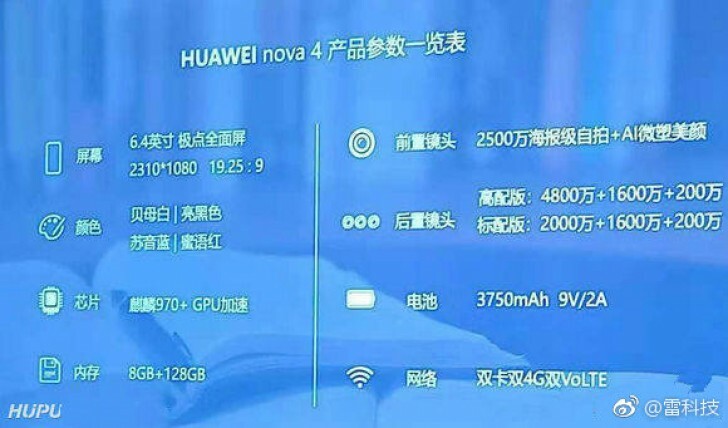 The Honor View 20 made a splash with its 48MP camera, but the mothership brand has a 48MP phone incoming too – the Huawei nova 4. However, not every will get the super high resolution sensor. Here’s a slide with specs that offer more details than TENAA did yesterday. The premium version of the phone will have a 48 + 16 + 2 megapixel triple camera on its back. The vanilla version will swap out the first sensor for a 20MP one. That’s still two more cameras than the Honor phone. A single 25MP selfie camera will occupy the punch hole in the top left corner of the screen. Speaking of, it will be a 6.4” screen with 1080p+ resolution (and an odd 19.25:9 aspect ratio). The nova 4 will use a Kirin 970 chipset – last year’s flagship grade chipset – instead of the 980. Anyway, the chip will be paired with 8GB of RAM and 128GB storage. The battery capacity is listed as 3,750mAh and it will support 18W charging.